Choosing artwork can be quite a challenge regardless of your home's style, have you ever taken a piece of art home to find it doesn't suit its surroundings, it's a very disappointing feeling as art is not just visual, it can be quite an expensive investment. 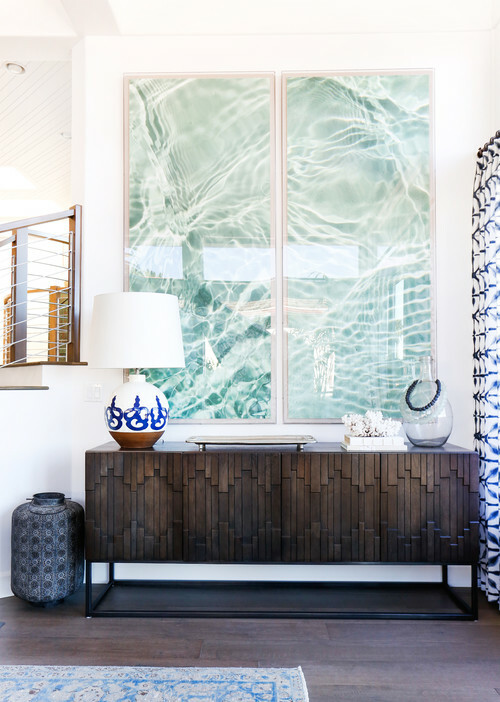 If you have a neutral, Hamptons style home, when it comes to art, the world is your oyster as long as you remember a few important points. Buying art should be about buying something you love, something that makes you happy every time you see it, whether it's the first thing you see when you wake or walk into a room or the last thing you see before you go to sleep. It may be a piece that makes an impact to visitors when you open your front door. Whatever and wherever you place it, you truly have to love it whether a photograph of a horse or a myriad of colours in an abstract piece. When you see artwork in a gallery the reason it looks great is because it will be against a background of white, there is nothing else in the room to fight with it, you see the piece in all it's glory, when you take the art home however, it has to fit in with your personal colour scheme, furniture, decorative pieces, the size of your wall, plus other art, and if you don't choose the right piece, it won't look right. 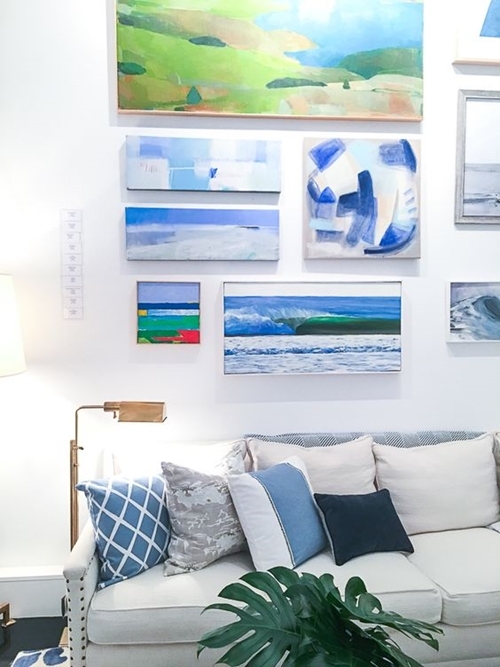 In a Hamptons style home usually colours are neutral and walls are often shades of white or subtle shades of grey or blue but predominantly your walls are likely a shade of white which makes it easier to select your art as it always shows to its best against a white background. Think about the size of the space you want to hang your art, and also where you want to place it within the space. I like my art to be central on a wall, especially if it is a large piece, which means equal dimensions either side. As for height, it should be hung so that the focus is at eye level. 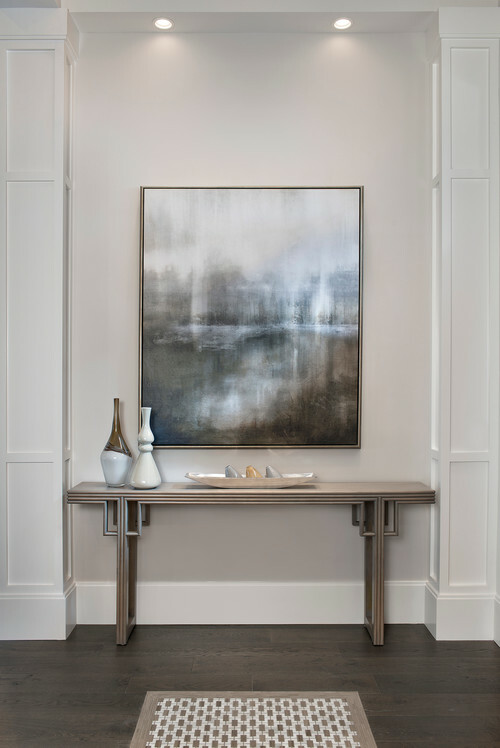 I have written a previous post on selecting artwork for your home which should help you when choosing art, not just for a Hamptons style home. With regards to a Hamptons style house black and white photography can look great, paintings associated with colours of the beach and seas are also popular choices. If the colours are subtle they will add to the relaxed feel you should be trying to achieve for this style of living. You could choose something more striking, however if you place it in an entrance to make an impact but try to look for softer tones for living and bedroom areas. To illustrate some ideas I have chosen examples of what I consider would suit a Hamptons style home. 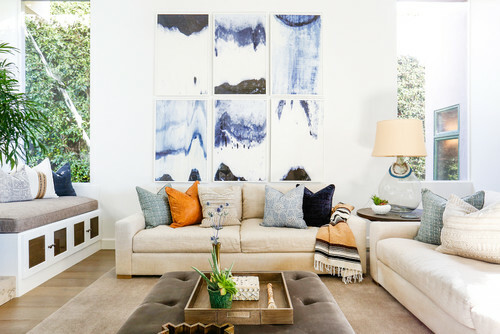 These images will help you envisage what style of painting might work in your own environment. 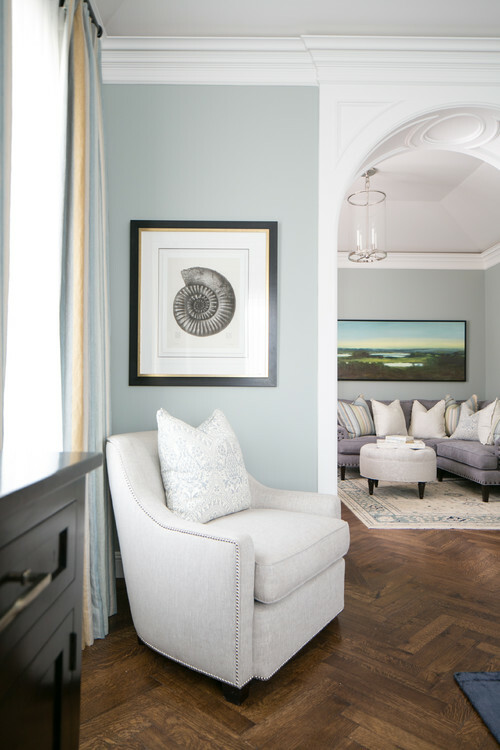 When you look at these images remember to take into account the size of the painting for the wall space and the colour palette of the overall room. Look also at the decorative pieces around the room and other colours and patterns that could work with or against your art. 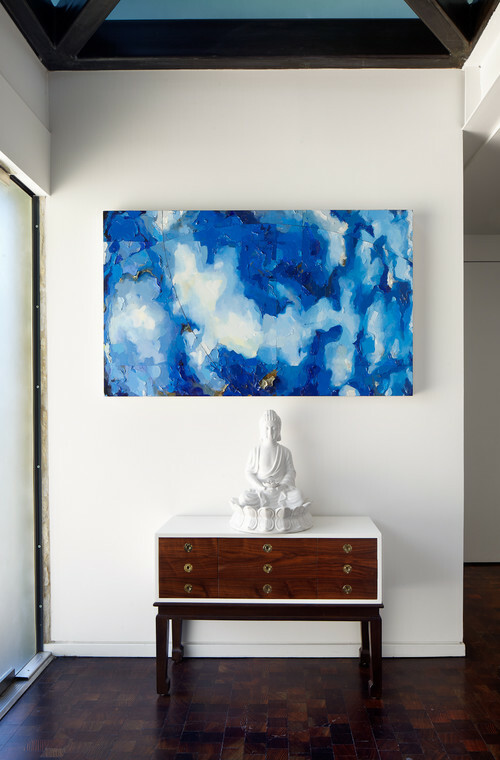 The art I have chosen lean towards what will work in Hamptons style space, a feel of the ocean and beaches without looking like the obvious. 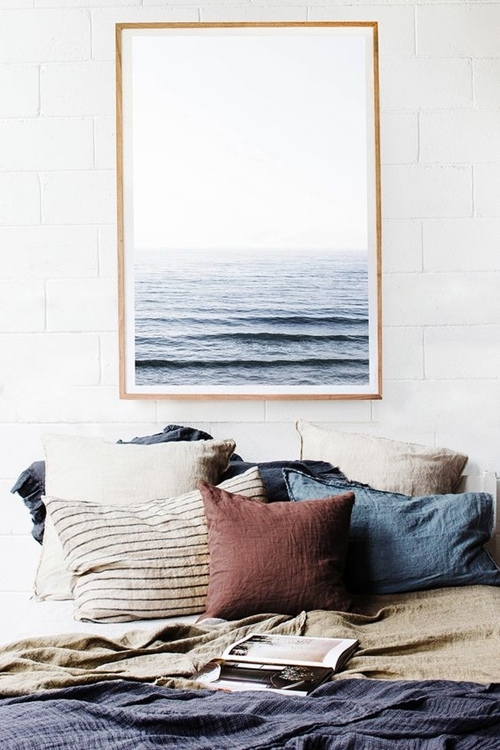 Above: Image via Brooke Wagner Design - A medium size print for a medium size wall, often people tend to choose small artworks for smaller walls but I say, "go as big as you can". Or group together smaller pieces to create a gallery wall. The other artwork in the room behind is of a different subject matter but the simple black frame compliments the frame of the historical print. 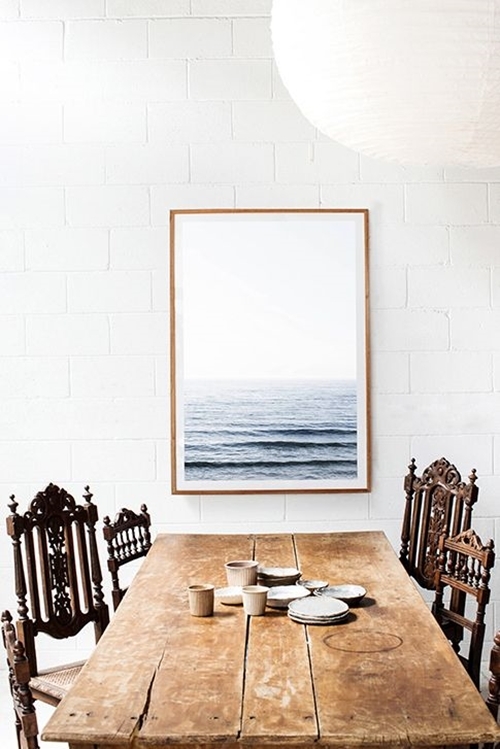 Above and Below, I love Karla Rosenlund's beautiful photography, see how this piece looks just as great in this dining space as it does in the chilled back, bedroom below. 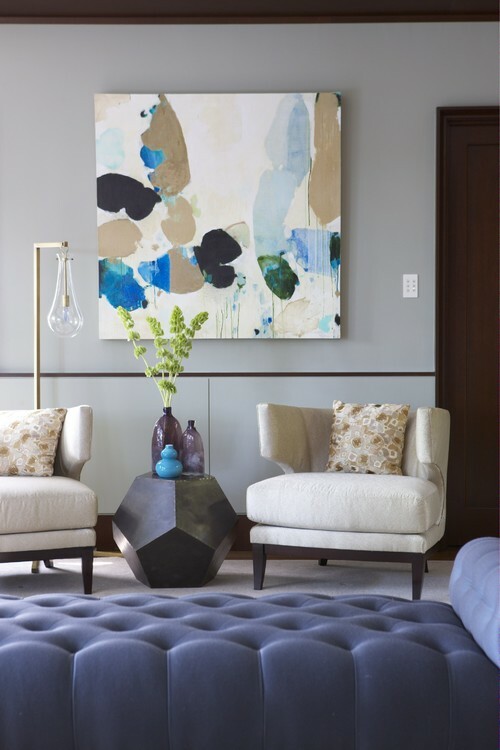 I hope this post has given you a few tips, if you want to know more about choosing artwork, you may want to read my post, Art, Go Big, Go Bold, or selecting artwork for your home or check out my Pinterest board below.